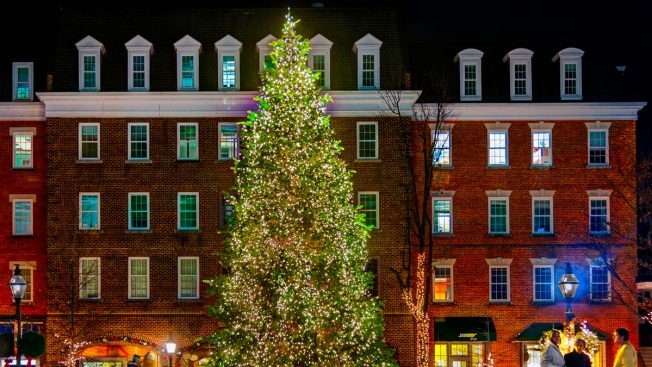 Listed as one of the top 10 Christmas-Crazy Towns by HGTV, Alexandria has a lot to offer when it comes to holiday fun. City of Alexandria Tree Lighting Ceremony(301 King St.) -- Join Santa and Mrs. Claus the day after Thanksgiving as they help light the city tree in Market Square. You'll also find live entertainment and a community singalong. 6.-8 p.m.; free admission. Scottish Christmas Walk and Parade (various locations) -- Immerse yourself in Scottish sights and sounds as bagpipers march in full finery. You'll also have the chance to tour Old Town homes decorated for the holidays, shop for gifts at a holiday marketplace, sample Scotch and more. Dec. 5, 9 a.m.-5 p.m.; Dec. 6, 9 a.m.-4 p.m.
Mount Vernon by Candlelight (3200 Mount Vernon Memorial Highway) -- From Nov. 28 through Dec. 21, "Martha Washington" will host evenings of candlelight tours, fireside caroling and festive treats. Saturdays and Sundays, 5.-8 p.m.; $22 adults; kids 11 and younger $15. The Little Theatre of Alexandria's "A Christmas Carol" (600 Wolfe St.) -- Experience Charles Dickens' classic a different way this holiday season during a production equipped with special effects. Dec. 5-20; Thurs.-Fri. 8 p.m.; Sat.-Sun. 3 & 5 p.m.; $15. Holiday Boat Parade of Lights(105 N. Union St.) -- On Dec. 6, watch as Alexandria's harbor light ups as more than 50 illuminated boats cruise the Potomac River at the historic waterfront. 5:30 p.m. Admission is free. Holiday Favorites With the Colonial Handbell Ringers (201 S. Washington St.) --The Colonial English Handbell Ringers will be using more than 80 handbells to perform several loved "Nutcracker Suite" selections, as well as new arrangements of popular classics. Dec. 14, 2 and 4 p.m. Free admission, but reservations are required; call 703-746-4994. Waterskiing Santa Comes to Old Town Alexandria (Alexandria's Waterfront between King and Oronoco streets) -- Witness Waterskiing Santa, his wakeboarding reindeer and all of his friends (including the Grinch) perform in a waterfront performance on Christmas Eve. Pre-show at 12:45 p.m.; main show 1 p.m.; free admission.